The America the Beautiful Quarters Program recently completed its second year of release, with five different designs representing National Parks or sites of America. The total mintage across the five designs rose compared to the previous year, although the increase was only attributable to a jump in production for the final design of the year. The 2011 America the Beautiful Quarters featured Gettysburg National Military Park in Pennsylvania, Glacier National Park in Montana, Olympic National Park in Washington, Vicksburg National Military Park in Mississippi, and Chickasaw National Recreation Area in Oklahoma. The total mintage across the five different designs reached 391,200,000 compared to a mintage of 347,000,000 for the first five designs of the series issued in the previous year. By individual design, the lowest overall mintage for the current year was reported at 61,000,000 for the Olympic National Park Quarter. 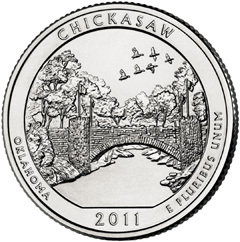 The highest overall mintage was 143,200,000 for the Chickasaw National Recreation Area Quarter. Mintage levels for the America the Beautiful Quarters still only represent a fraction of the number of coins issued for each design of the previous 50 State Quarters Program. In fact, production for the first ten designs of the ATB Quarters Program has still not reached the mintage level for the first design for the State Quarters Program. In 1999, the US Mint began the innovative program by producing 774,824,000 Delaware Quarters. Mintage levels rose in the following year, reaching a peak with the production 1,594,616,000 Virginia Quarters. At the onset of the America the Beautiful Quarters Program, the US Mint attributed the lower production levels to decreased orders for new coinage placed by the Federal Reserve Banks. A large surplus of quarters had built up at the Federal Reserve Banks due to residual or redeposited coins from the State Quarters Program. Compounding the problem, the economic conditions of 2008 and 2009 caused a large number of previously issued quarters to return to active circulation, significantly reducing the need for additional payments to circulation by Reserve Banks. As a result of this situation, the Reserve Banks curtailed orders for new coinage and attempted to work down the existing surplus. At the end of 2009, Federal Reserve Banks held about 3.8 billion quarters in inventory. This amount was reduced by 500 million as of May 31, 2010, according to testimony delivered by the Director of the Division of Reserve Bank Operations and Payment Systems. If the same rate of reduction was maintained throughout 2010 and 2011, the Reserve Banks may have finally reduced inventory levels enough to warrant increased orders for new quarters. Based on the jump in production for the final quarter issued in 2011, this seems to be a distinct possibility. After two years of unusually low mintages, the America the Beautiful Quarters Program may see higher production and more widespread distribution in 2012.